I turned around just in time to watch a friend saw his finger off with the band saw in HS shop class. I’ve taken safety very seriously ever since. So far I still have all my fingers and HS was a really long time ago. This blog post notwithstanding, I agree and take safety very seriously. I’ve had a couple of minor accidents over the years, luckily nothing too serious although enough to drive home the real importance of safety. 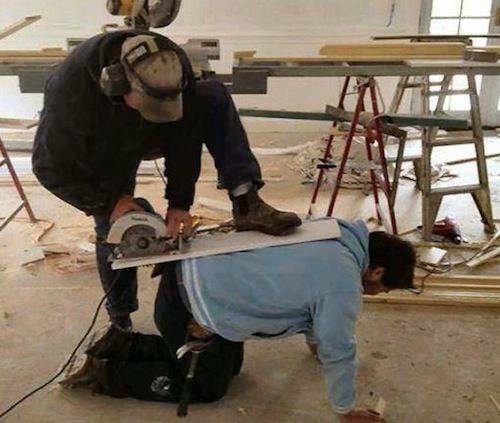 And the sawhorse guy isn’t wearing hearing protection too! I know, right? Just plain dangerous! gives a new meaning to ‘plumber’s crack’.